Investors who had forgotten gold and silver yesterday suddenly discovered it today. Shorts got creamed and the GOLD PRICE gave positive witness of a rally. The GOLD PRICE jumped $22.80 or 2.1% to $1,084.50 on Comex. SILVER soared 3.2% or 45.2 cents to $14.505. My tripwires for a metals’ rally were $14.40 silver and $1080 gold price. Both tripped those wires and then some. Gold’s close at $1,084.50 took it comfortably above its 20 DMA at $1,075. Silver’s 20 DMA stands at $14.23, so a $14.505 close effortlessly left that behind. GOLD/SILVER RATIO fell today to 74.767, positive for a rally. Sliced through its 50 DMA (74.59) and 200 DMA (74.05), but didn’t close down there. That’s okay, it will come back down. Loaf has been sliced already. Any gold strength elsewhere? Gold stock indices jumped like they hit a 440 volt line: HUI up 6.23%, GDX up 5.3%, and XAU up 5.9%. Gold/Bank Stock index spread (confidence in gold vs confidence in the financial system) appears to have double bottomed, July and end-November, and turned up. Wow, it was a wild week. ECB head Mario Draghi threw markets into consternation when he announced the ECB would not be disemboweling the euro as quickly as they expected. Since every trader in the world was short euros and long dollars, they panicked, sending the euro soaring and the dollar tanking, down a massive 2.4%. Stocks plummeted but silver and gold prices moved little. Today markets remembered that gold and silver existed, and they jumped. Platinum and Palladium confirmed. First, a footnote. I apologize, my explanation yesterday of why higher interest rates mean lower stock prices was neither clear nor exact. Let me explain it this way. Suppose a bond pays $110 in one year. Never mind what the original buyer pays for it, the secondary market where you go to sell the bond will value the bond not by the rate it pays on its face, but by the future amount it will pay DISCOUNTED by the CURRENT interest rate. So if you buy a bond in the secondary market when the prevailing interest rate is 10%, and the next day the interest rate rises to 12%, your bond is worth less. For instance, a bond that pays $110 in one year, discounted at 10%, is worth $100.00 today in the secondary market. That same bond discounted at 20% is worth $91.67 today. Stocks are simply securities like a bond, and in the secondary market their value is discounted by the prevailing interest rate. Like a bond’s value, a stock’s value, other things being equal, will drop when interest rates rise. Never mind all that, no logic lives in stock market heads today. They’ve lived so long under the threat of the Fed raising rates they can’t think of ought else. The LGER (Lying Government Employment Report) came out with more jobs created than expected (they’re hiring at McDonald’s and Walmart) and that sent stock buyers into a buying frenzy. Dow rose 369.96 (2.12%) to 17,847.63 — not quite as high as its 4 December close. S&P500 leapt 42.07 (2.05%) to 2,091.69. Don’t miss this: despite stocks’ garlicky move today, the Dow in Gold and Dow in Silver continued falling. That spotlights the last highs as the ultimate highs, provided we see further moves downward to confirm. Both closed beneath 20 DMAs. Now y’all ponder a moment: when everybody was on the same side of the short euros/long dollars trade and the ECB disappointed them, chaos erupted. Now markets show an 80% expectation that the Fed will raise rates on 16 December, so they’re all long stocks. But so what? What can a 1/4 of 1% rise mean? Nothing good, so why should anyone expect stocks to rise from a raise? Rather, this will be a classic instance of “buy the rumor, sell the news,” even IF the Fed doesn’t disappoint. What would happen if the Fed flinches? I leave that to y’all’s imagination. Whether the 2.4% fall yesterday broke the dollar rally’s back or not remains to be seen, but the suspicion of that diagnosis will linger until the dollar climbs over 100.70. Interesting will be what it does when it reaches the 200 day moving average at 96.72, and whether holds or falls through. Today the dollar recaptured some of yesterday’s 239 basis point loss by rising 71 bps (0.73%) to 98.35. This says nothing, nor shows e’er a sign of recovery. 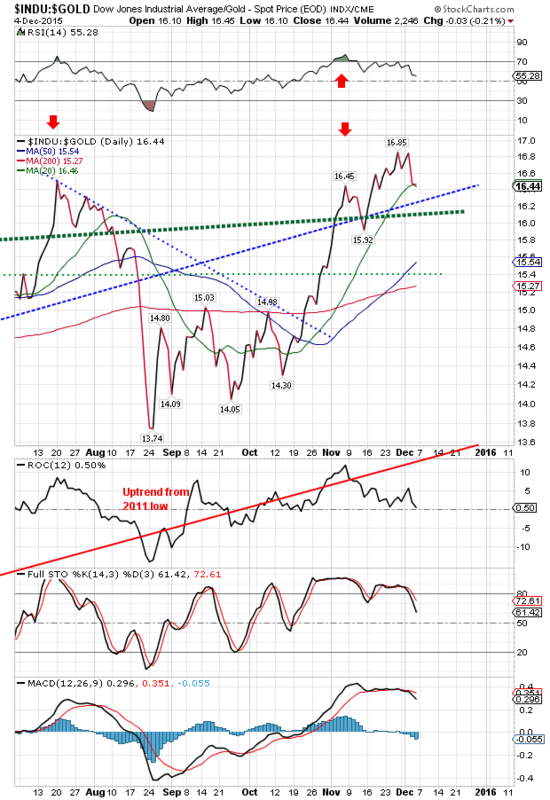 Dollar would have to exceed its 20 DMA, now at 99.39, to show any optimism. Euro gave back 0.58$% today to close at $1.0874. Needs to close above that 200 DMA ($1.1043) to confirm reversal. Yen closed down 0.45% at 81.21. 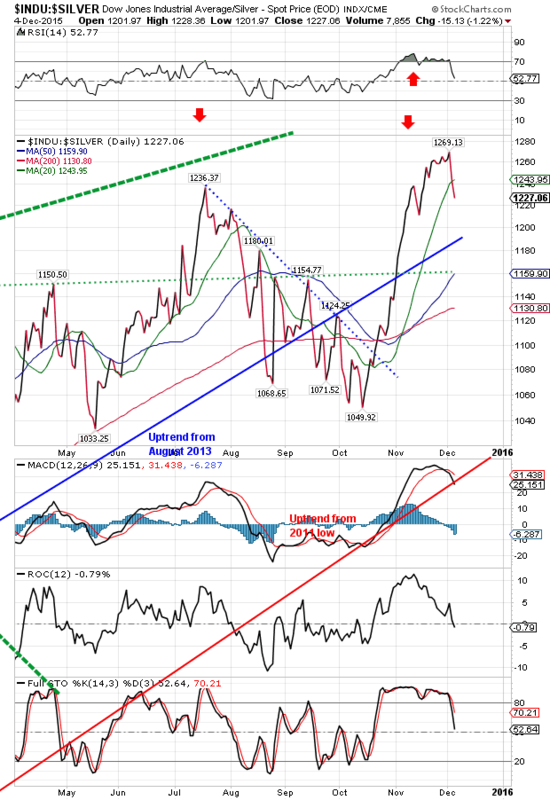 No trend reversal upward yet.